To be used with all cutting wheels, sanding discs and polishing wheels. Disc used to polish most metal and plastic surfaces. Using No.421 polishing compound with wheels produces a high luster. Use with No.401 mandrel. Do not run in excess of 30,000 RPM. Standard duty copper-plated battery clamps. Includes positive and negative clamps. Accepts up to #8 gauge cable. Heavy duty construction and easy grip handles. Carefully manufactured for sound, solid connections and trouble-free service. Easily crimped or swaged. Made from electrolytic copper rated for 100% conductivity. Carded 2-pack. Carefully manufactured for sound, solid connections and trouble-free service. Easily crimped or swaged. Made from electrolytic copper rated for 100% conductivity. Carded 2-pack. Replaceable sanding bands covered with aluminum oxide abrasive used for rough shaping or smoothing of wood and fiberglass. Removes rust from metal surfaces and shapes rubber surfaces. Requires a mandrel with a 1/8" shank. Do not run in excess of 30,000 RPM. Makes fast clean cuts in drywall for electrical boxes, air vents and other wall features. Do not run in excess of 30,000 RPM. Replacement flints for single flint striker. Fits "Forney" 86102 (sku #: 891.2586) and all standard screw-on type lighters. 5-pack. Carefully manufactured for sound, solid connections and trouble-free service. Easily crimped or swaged. Made from electrolytic copper rated for 100% conductivity. Carded 2-pack. Carefully manufactured for sound, solid connections and trouble-free service. Easily crimped or swaged. Made from electrolytic copper rated for 100% conductivity. Carded 2-pack. Polishing point is made to take a semi-rough finish and polish it to a smooth finish on most ferrous metals, stones, glass and ceramics. Used with 401 mandrel. Do not run in excess of 30,000 RPM. Replaceable sanding bands covered with aluminum oxide abrasive used for rough shaping or smoothing of wood and fiberglass. Removes rust from metal surfaces and shapes rubber surfaces. Requires a mandrel with a 1/8" shank. Do not run in excess of 30,000 RPM. Features a square hood and round file with a patented assembly. Use for detail engraving, carving and routing in wood, fiberglass, ceramics, plastic, jewelry and soft metals. Do not run in excess of 30,000 RPM. A high quality industrial abrasive made for extended general purpose grinding on metals, castings, welded joints, rivets and rust. Specially designed for working with conic surfaces. Do not run in excess of 30,000 RPM. A high quality industrial abrasive made for extended general purpose grinding on metals, castings, welded joints, rivets and rust or for working with conical surfaces. Do not run in excess of 30,000 RPM. A cylinder covered with aluminum oxide abrasive that sits atop a mandrel with a 1/8" shank. For rough shaping and smoothing wood and fiberglass. Ideal for removing rust from metal surfaces. Also ideal for shaping rubber surfaces. 1/4" bit diameter (6.4 mm). Pack of 6. Carefully manufactured for sound, solid connections and trouble-free service. Easily crimped or swaged. Made from electrolytic copper rated for 100% conductivity. Carded 2-pack. Carefully manufactured for sound, solid connections and trouble-free service. Easily crimped or swaged. Made from electrolytic copper rated for 100% conductivity. Carded 2-pack. Carefully manufactured for sound, solid connections and trouble-free service. Easily crimped or swaged. Made from electrolytic copper rated for 100% conductivity. Carded 2-pack. Polish silverware to high luster, car detailing and restore door and window hardware. Compatible with all Dremel rotary tools, EZ402 EZ Lock mandrel and standard 402 mandrel (619.9400). Do not run in excess of 30,000 RPM. Cuts wood, plastic, fiberglass, drywall, laminate and aluminum and vinyl siding. Do not run in excess of 30,000 RPM. For cleaning, light sanding and removing tarnish from brass. Use on metal, glass, wood, aluminum and plastics. For use with the EZ402 EZ lock mandrel (SKU #482.4447) or standard 402 mandrel (SKU #619.9400). Includes 2 fine 320 grit buffs. Includes four (4) replacement triangles for a total of 12 flints. Carefully manufactured for sound, solid connections and trouble-free service. Easily crimped or swaged. Made from electrolytic copper rated for 100% conductivity. Carded 2-pack. Used for sharpening chain saw blades, quickly and easily. Used for sharpening chain saw blades, quickly and easily. Carefully manufactured for sound, solid connections and trouble-free service. Easily crimped or swaged. Made from electrolytic copper rated for 100% conductivity. Carded 2-pack. For No. 275, No. 285, and No. 395 Type 3, 4 and 5 Moto-Tools. Easily cuts off slots bolts, screws, sheet metal, thin wood and plastic, trim castings and molded ceramics. Cuts only along its edge. Do not attempt to sand or cut curved holes. Do not run in excess of 30,000 RPM. Use with No. 402 mandrel. Sanding Band covered with 60 grit aluminum oxide abrasive. Use for rough shaping, smoothing wood or fiberglass, removing rust from metal surfaces and shaping rubber surfaces. Bands are easily replaceable on drums. Do not use in excess of 30,000 RPM. Quality tool with a rugged frame and three (3) large flints. Long lasting round file and bright plated finish. Dependable ignition under all working conditions. Release slotted screw to rotate fresh flint into position. A high quality industrial abrasive made for extended general purpose grinding on metals, castings, welded joints, rivets and rust or for working with conical surfaces. Do not run in excess of 30,000 RPM. Carefully manufactured for sound, solid connections and trouble-free service. Easily crimped or swaged. Made from electrolytic copper rated for 100% conductivity. Carded 2-pack. Used for sharpening chain saw blades, quickly and easily. Great for light shaping and sanding. EZ Lock for faster accessory changes. Compatible with both No.EZ402 EZ lock mandrel and standard No.402 mandrel and all Dremel rotary tools. Refinish furniture, clean grills, remove paint, tarnish and more. Includes 2 buffs, 1 coarse, 180 grit and 1 medium, 280 grit. Emery impregnated disc is ideal for general polishing of most ferrous metals, stones, glass and ceramics. Also ideal to clean and define grooves. Use it to remove small burrs and scratch marks left by grinding and sanding. Ideal for light deburring, general cleaning and polishing in hard to reach places such as slotted surfaces. Long wearing nylon bristles. Can also be used for cleaning hard plastic such as graphite golf clubs or aluminum wheels. Can be used with polishing compound. Ideal for light deburring, cleaning and polishing in hard to reach places such as slotted surfaces. Nylon bristles make it great for polishing silverware, jewelry and other precious metals. Can also be used for cleaning hard plastic or aluminum such as graphite golf clubs or aluminum wheels. Can be used with polishing compound. Versatile brush for removing rust and corrosion. For use on items made of brass, copper, gold or other soft ferrous metals such as tools, door knobs, automobile parts and electrical contacts. Can also use wire brushes to create an artistic effect on coarse-grained wood. Its shape makes it well suited for cleaning flat surfaces and getting into hard to reach places like slots. For slicing and cutting metal, wood and plastic. Easily cuts or slots bolts, screws, sheet metal, thin wood and plastic. Trims castings and molded ceramics. Cuts only along its edge. Do not attempt to sand or cut curved holes. Do not run in excess of 30,000 RPM. Use with No.402 mandrel. Ideal for cleaning, deburring and surface finishing. Use on items made from stainless steel, aluminum, silver, pewter or other white metals. Very effective on flat surfaces and in hard to reach places such as slots. Stainless steel wire bristles. Ideal for cleaning, deburring and surface finishing. Use on items made from stainless steel, aluminum, silver, pewter or other white metals. Very effective on flat surfaces and in hard to reach places such as slots. Stainless steel wire bristles. Ideal for cleaning, deburring and surface finishing items made from stainless steel, aluminum, silver, pewter or other white metals. Very effective on flat surfaces and in hard to reach places such as slots. Stainless steel wire bristles. Great for polishing and cleaning. Ideal for cleaning and surface finishing. Use on items made from gold, bronze, copper or brass. Use a brass brush to create a soft, sating or matte finish. Very effective on flat surfaces and in hard to reach areas like slots (brass wire is non-sparking and softer than steel). Ideal for cleaning and surface finishing items made from gold, bronze, copper or brass. Use a brass brush to create a soft, satin or matte finish. Very effective on flat surfaces and in hard to reach areas like slots (brass wire is non-sparking and softer than steel). Ideal for cleaning and surface finishing items made from gold, bronze, copper or brass. Use a brass brush to create a soft, satin or matte finish. Very effective on flat surfaces and in hard to reach areas like slots (brass wire is non-sparking and softer than steel). Designed for light stock removal and high luster polishing. Works on a variety of surfaces including steel, aluminum, brass, silver, hard plastics, gold and other metals. Impregnated with silicone abrasive and lubricant. Eliminates the need for polishing compound. Made of high quality steel. Use for shaping, hallowing, grooving, slotting, making tapered holes in soft metals, plastics and woods. Do not run in excess of 30,000 RPM. Made of high quality steel. Use for shaping, hallowing, grooving, slotting, making tapered holes in soft metals, plastics and woods. Do not run in excess of 30,000 RPM. MIG contact tips are compatible with "Forney" (00306 and 00308), "Tweco", "Binzel" or "Clarke" MIG guns. It is precision machined. 4-pack. Kit consisting of a special collet nut and four collets for use with a variety of Dremel tools, attachments and handpieces. Allows you to quickly change collets to accept bits with shanks of 1/32" to 1/8". Kit contains (1) each 1/8" Collet, 3/32" Collet, 1/16" Collet, 1/32" Collet and Collet Nut. For slicing and cutting metal, wood and plastic. Easily cuts or slots bolts, screws, sheet metal, thin wood and plastic. Trims castings and molded ceramics. Cuts only along its edge. Do not attempt to sand or cut curved holes. Do not run in excess of 30,000 RPM. Use with No.402 mandrel. Diamond wheel kit includes (2) 3/4" (19.05 mm) diamond wheels and (1) 1/8" Mandrel. For cutting metal, glass, ceramics and plastics. Max rpm: 30,000. 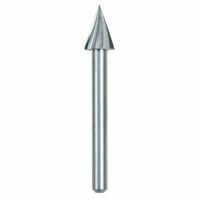 High-speed cutter tipped with diamond particles tapered to a fine point for detail work. Used for engraving carving, finishing and other fine detail work on a variety of materials including wood, glass, ceramic and hardened steel. High-speed cutter tipped with diamond particles tapered to a bullet point for fine detail work. Used for engraving carving, finishing and other fine detail work on a variety of materials including wood, glass, ceramic and hardened steel. For routing, inlaying and mortising in wood and other soft materials. Use with Dremel 230, 330 router attachments and 231 (678.2148) shaper/router table. Made of high-speed steel. Do not run in excess of 30,000 RPM. For routing, inlaying and mortising in wood and other soft materials. Use with Dremel 230, 330 router attachments and 231 (678.2148) shaper/router table. Made of high-speed steel. Do not run in excess of 30,000 RPM. Cuts a variety of ferrous and nonferrous materials. 3/4" cut depth. .05" wheel thickness. For use on SKU# 454.6933. High speed versatile, carving and engraving cutter. Made of high quality steel for use on wood, plastic and soft metals. Ideal for shaping, hollowing, grooving, slotting and inlaying. Appropriate for curved surfaces. Bit diameter: 3/16" (4.8mm). 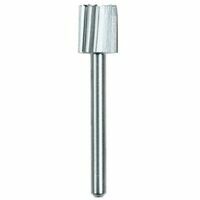 Dremel Rotary Tool Bit, 1/4 in Diameter, 1/8 in Shank Diameter, HSS Cutting Edge, Applicable Materials: Wood, Plastic and Soft Metal, 25000 - 30000 rpm Maximum, For Shaping, Hollowing, Grooving, Slotting, Inlaying and Making Tapered Holes 8" (203.2mm) long with 1-3/4" (44.4mm) wide jaw opening. Accepts up to #2 welding cable. Rugged, economical ground clamp for shop maintenance and field work. Good positive connection. Suitable for all farm and shop welders. 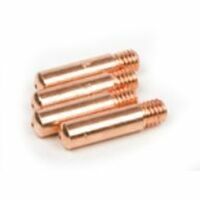 Bits are made of high speed steel and used for drilling into soft materials. Includes: 1/32", 3/64" bits (use #483 collet), 1/16" bit (use #482 collet), 5/64", 3/32" bits (use #481 collet) and 7/64", 1/8" bits (use #480 collet). One piece mandrel design simplifies the process of changing accessories and makes it easy to cut through a range of materials from metal to plastic. For use with exclusive EZ Lock Accessories. Allows you to quickly and easily change accessory bits on rotary tools 9.6V without changing collets. Accepts all accessory bits with 1/32" to 1/8" shanks. For cutting plastics. Compatible with all Dremel rotary tools. Pull-twist-release accessory changes. For use with the EZ402 EZ lock mandrel (SKU #482.4447). For routing, inlaying and mortising in wood and other soft materials. Use with Dremel 230, 330 router attachments and 231 (678.2148) shaper/router table. Made of high-speed steel. Cuts through metal. Pull-twist-release accessory change. Use with either EZ402 (SKU #482.4447). One piece mandrel design simplifies the process of changing cutting wheels and makes it easy to cut through metal. Cut off wheels labeled for easy identification. Compatible with all Dremel rotary tools . Designed to flush-grind a surface. Domed shape and extra-thick reinforced aluminum oxide material allows the grinding wheel to be used on either its side or face for surface grinding, shaping, smoothing, deburring, rust removal sharpening, and flush-grinding. Applications include extended general-purpose grinding on metals, castings, welded joints, rivets and rust. Use with either EZ402 (SKU #482.4447). Cuts a variety of materials such as wood, laminate flooring, drywall, PVC and plastic. 3/4" cut depth. .075" wheel thickness. For use on SKU# 454.6933. High-speed cutter shapes ceramic wall tile around bathroom or kitchen fixtures or plumbing pipes or create decorative wall tile by cutting a design. Commercial-grade battery charger clamps with parrot-style zinc-plated jaws. Includes positive and negative clamps. Accepts up to #2 gauge cable. heavy duty construction and easy grip handles. Fast cutting, structured tooth-tape, for greater material removal on fiberglass, wood, plastic, epoxy, rubber, laminates, particleboard and ceramic tile. Cuts most tiles and masonry materials such as wall tile, floor tile, porcelain, slate, stone and cement backer board. 3/4" cut depth. .075 wheel thickness. For use on SKU# 454.6933. Set contains: mandrel, (2) 1/2" felt polishing wheel, high-speed cutter, 1-1/4" fiberglass-reinforced cut-off wheel, aluminum oxide grinding stone, silicon carbide grinding stone, mandrel, nylon brush, (36) 409 15/16" emery cut-off wheel, 1/2" drum sander, 1/2" coarse sanding band, polishing compound, (2) 1/2" fine sanding band, (2) 1" felt polishing wheel and storage box. Applications: cutting, grinding, carving, engraving, shaping, sanding, cleaning and polishing.. 20 piece set with assorted shapes and sizes of nickel bonded diamond points. 1/8" (3.18mm) shank. Excellent for deburring, etching and smoothing of glass, plastic, ceramics and metals. Max rpm: 30,000. For cutting metal. One-piece mandrel design simplifies process of changing cutting wheels, eliminates the need for screw and screwdriver. Effortless locking and loading, no tiny mandrel to lose. Compatible with all Dremel rotary tools. Includes No.EZ402 Mandrel and (5) No.EZ456 cutting wheels. Color code red. Do not run in excess of 35,000 RPM. Use to cut 1/2" wood and laminate. Pull-twist-release accessory change. For use with the EZ402 EZ lock mandrel (SKU #482.4447). Guides help restore edge on garden tools, sharpens all lawn mower blades and sharpens dull, slow-cutting chain saw blades. Includes garden tool, lawn mower and chain saw sharpening attachment, gauge, spacers, wrench, (4) sharpening stones and instruction manual. Fits tool models 4000, 3000, 400, 398, 395, 300, 285, 275, 200, 100, 8200, 800, 780, 770, and 7700. For use all dremel tools. Powerful shaping tool that quickly and efficiently removes material. Easily creates compound curves and works on a variety of materials including woods, fiberglass, laminates, plastic and leather.o.Cuts and finishes in one operation. Use the edge of the wheel for cutting and slotting. Use the "face" of the wheel for shaping. Cuts 33 percent deeper than former cutting/shaping wheels up to 1/2". DO NOT USE ON METAL For #2 thru #6 welding cable. Cable splicer for permanently splicing damaged or broken cables and adding additional cable length to existing welding cable leads. Provides controlled cuts in a variety of materials. Depth adjustment sets correct cutting depth up to 3/4". Easy screw-on mounting and large window provides excellent visibility. Specs: fits tool models 400, 398, 395, 300, 285, 275, 200, 100, 800 and 780. Includes: multipurpose cutting guide attachment, (2) drywall cutting bits, (1) multi purpose cutting bit and instructions. Offers enhanced grip and comfort for detailed applications. Provides optimal tool control when precision is required. Repositions the weight of the tool into the palm of your hand for a balanced feel and less fatigue. Attaches onto a rotary tool in place of its nose piece for quick and easy installation. Includes detailer's grip attachment, engraving cutter, tracing stencil and instructions. For making flush cuts on a variety of materials such as wood, laminate flooring, drywall, PVC and plastic. Dome-shaped. 3/4" cut depth. .075" wheel thickness. For use on SKU# 454.6933. Long lasting, does not break, will not lose it's shape. Coated with fine diamond particles, smooth fine cut. Hole design to minimize heat buildup. Applications: cutting, sawing, carving, sharpening and filing hard materials including marble, concrete, brick, porcelain, ceramics, hard epoxy, soft and hard wood. Includes: No. 402 mandrel. Includes (3) 180, 280, & 320 grit abrasive buffs, (2) 36 & 120 grit detail abrasive wheels, (1) cloth polishing wheel and polishing compound. Sharpen lawn tools, remove rust, sand a sticker, engrave glass, plus more. Contains 31 genuine Dremel accessories for most every sanding, smoothing, shaping or grinding need. Includes a reusable storage box with removable organizer tray. Kerf: 0.05"; Blade thickness: 0.05"; Grit: 60, 120, 180 and 220. Color code: Blue. For use on glass, ceramic wall tile, glass block, glass bottles, and jewelry. For drilling in both flat and contoured surfaces. Diamond-impregnated cutting bit. Diamond grit around the circumference of the bit allows it to rasp a larger hole if needed. Holes on the side of the bit allow the removal of material. Includes cutting oil and instructions. Quick connectors for #1 through #4 welding cable extensions. Heat and oil resistant covers. Cuts through metal. Pull-twist-release accessory change. Use with either EZ402 (SKU #482.4447). Use to cut through metal. Pull-twist-release accessory change. Compatible with all Dremel rotary tools. For use with the EZ402 EZ lock mandrel (SKU #482.4447). Includes (4) 1-1/2" metal-cutting wheels, (3) 1-1/2" thin-cut wheels and (3) 1-1/2" plastic cutting-wheels. Use with either EZ402 (SKU #482.4447). Coupling system allows you to rotate the attachment on your tool making hard to reach areas instantly accessible with the Right Angle Attachment. Specs: ball bearings and spiral bevel gears, quick connect system no tools required, compact, long-lasting and versatile. Fits tool models 400, 398, 395, 300, 285, 275, 800 and 780. Includes: right angle attachment and instructions. A versatile, high-quality cutter made of high grade steel. Ideal for shaping, hollowing, grooving, slotting and inlaying. 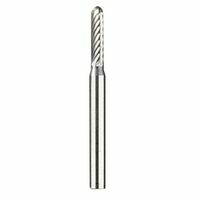 Also ideal for making tapered holes in soft metals, plastics and woods. 1/8" bit diameter (3.2 mm). Attachments unique shape keeps the bit at the perfect cutting angle and keeps the cutting bit centered between the tiles, 30 degree cutting angle provides controlled cutting along the grout line. Special guides keep the bit centered between tiles. Large window for cut line visibility. Depth adjustment controls cutting depth up to 3/8" below the tile surface. Removes both wall and floor grout. Includes: grout removal attachment, 1/16" carbide grout removal bit and instructions. The flexible, 36" shaft attaches easily, new 5" bend radius provides more flexibility during use. Specs: comfort grip hand piece, integrated shaft lock button, Quick connect, accepts up to 1/8" shank accessories, works with collet system and the dremel chuck. Fits tool models 400, 398, 395, 300, 285, 275 and 800. Includes: flex shaft attachment, square drive nut and instructions Versatile and reusable accessory kit includes everything you need to cut, grind, sand, polish, drill, sharpen and clean. Includes: 1-1/4" cut off wheel, 3/4" carbon steel brush, polishing compound, (4)-four-1" felt polishing wheel, silicon carbide grinding stone, high speed cutter, 1/2"/60 grit sanding drum with mandrel, 1/4"/60 grit sanding band with mandrel, mandrel, wrench, aluminum oxide grinding stone, silicon carbide grinding stone, aluminum oxide grinding stone, (12)-twelve-15/16" emery cut off wheel, (12)-twelve-15/16" heavy duty emery .-cut off wheel, 1-1/4" fiberglass reinforced cut off wheel, (4)-four-small felt wheel, cone polishing tip, (6)-six-1/2"/60 grit sanding band, (12)-twelve- 3/4" 180 grit sanding disc, (12)-twelve- 3/4"/220 grit sanding disc, (12)-twelve- 3/4"/.240 grit sanding disc, (6)-six-1/4"/60 grit sanding band, (6)-six-1/2"/120 grit sanding band, (6)-six- 1/4"/ 120 grit sanding band, mandrel, dressing stone, bristle brush and 180 grit abrasive buff. Use to cut drywall, wood, plastic, metal, cement, brick, and more. Includes (7) genuine Dremel Saw-Max cutting wheels: (1) SM500 wood and plastic carbide wheel, (1) SM540 tile diamond wheel, (2) SM520 masonry cut-off wheels and (3) SM510 metal cut-off wheels. Inside this accessory set are assorted bits for cutting, carving, engraving, grinding, drilling, sharpening, sanding, cleaning and polishing. The kit consists of regular cut off wheels, sanding bands, sandpaper discs, felt polishing wheels, carbon steel brush, aluminum oxide grinding stones, silicon carbide grinding stones, dressing stone, mandrels, wrench and a re-usable storage case. 8" (203.2mm) long with 2" (50.8mm) jaw opening. Accepts up to #1/0 welding cable. Rugged, versatile, wide jaw ground clamp. Good for most grounding situations. Large contact surface area provides good cable connections and positive grounding. Quick connectors for #1 through #4 welding cable extensions. Heat and oil resistant covers. Attaches to the rotary tool in seconds with Quick Connect System. Specs: makes clean, straight perpendicular cuts up to 1/4" thick, angled throat allows for straight, perpendicular cuts, clear housing for better visibility, directional guide and lower guard retracts when not in use. Includes: mini saw attachment, rip/crosscut blade, drive adapter and instruction manual. 7-3/8" (187.3mm) long with 1-1/2" (38.1mm) jaw opening. Accepts up to #2 welding cable. Includes shim stock and wrench. For heavy duty use. Large contact area assures positive grounding. Oval-point screw cable connections make installation easy, assuring good, safe cable connections. Wide grooved jaws for positive ground. Comes with re-usable storage case and 160 accessories. Lift out trays for easy organization of the included bits. This kit is ready for cutting, grinding, polishing, sanding, cleaning and more. The kit also includes sanding bands, sandpaper discs, polishing compound, felt polishing wheels, aluminum oxide grinding stone, silicone carbide grinding stone, mandrels, wire brush and wrench. A complete start-up kit offering a breadth of accessories helpful for a wide assortment of tasks. Ideal for auto body repair and fabrication on most ferrous metals. Contains a high level of manganese and silicon for a superior weld, even on rusty, dirty steel. Produces a smooth bead which requires less grinding. Not recommended for aluminum engines. Yellow color coding on label. Required Shielding Gas: Argon/CO2. Recommended Polarity: DCEP Reverse Polarity. Tensile Strength (PSI): 70,000. Drill press, tool holder and flex shaft holder all in one, drills accurate perpendicular and angled holes. Holds your tool in place for applications like sanding and buffing, and the telescoping flex shaft holder extends to any height between 16 and 29 inches. Specs: base 56 square inches, drill depth 2 inches, fits tool models 275, 285, 300, 395, 398, 400, 780 & 800. Includes: work station attachment, mounting wrench and instructions. Sands any type of wood surface, micro filter dust canister helps keep work area clean, auto track belt alignment keeps belt centered, soft grip, flush edge sanding, Lock-on on/off switch, attachment for shop vacuum controls dust as you sand. Specs: 120V, RPM (loaded) 1050, 6 ft. cord length, weight 8.2 lbs. Includes: (1) sanding belt, dust collection canister, vacuum adaptor. Angled belt sands three times closer to the edge of the adjoining surfaces, retractable hood exposes top of sanding belt for use in a variety of applications, three position adjustable handle, dust collection with easy empty dust bag. Specs: ft/min 800 fpm. Includes: sander, medium grit sanding belt, dust bag, manual. Variable speed for optimum finish. 3" x 21" - 3" x 5-1/2" platen; variable speed 790 - 1,300 sfpm. Rubber grips for comfort and control. 10' power cord. Includes dust bag and sturdy plastic carrying case. Variable speed dial, motor is located over platen for performance and balance, belt and gear drive system transfers power from the motor to the sanding belt, flush sanding up to vertical surfaces, dust bag swivels 360 degrees, fingertip belt tracking knob, quick release belt change lever. Specs: 120V/AC, 25-60 Hz, SFPM 850-1,300, 12.5"Lx5.75"Wx10.38"H, weight 10.75 lbs. Includes: (1) 100g ceramic aluminum oxide belt, dust bag assembly. Highly flexible cable manufactured with 1,007 strands of fully annealed soft-drawn copper. Uses paper separator between copper and outer EPDM jacket. Will not kink, even in cold weather. Outer jacket has excellent oil, grease, water, flame, tear, cut and abrasion resistance. Rated at 600 volts. Conductor temperature range of -58? F (-50? C) to 221? F (105? C). Meets or exceeds ASTMB-172. 50' (15.24m) reel. Variable speed control dial matches the speed to the application, auto tracking belt system, sands flush to wall with nose and side of sander, front grip, dust bag. Specs: 120V, only 85dB, ft./min. 690-1,440 , 11-5/8"L, 16.4 ft. power cord, double insulated, weight 9.5 lbs. Includes: (1) #80 abrasive belt, dust bag. #4 gauge highly flexible welding cable manufactured with 378 strands of fully annealed soft-drawn copper. Uses paper separator between copper and outer EPDM jacket. Will not kink, even in cold weather. Outer jacket has excellent oil, grease, water, flame, tear, cut and abrasion resistance. Rated at 600 volts.Conductor temperature range of -58? F (-50? C) to 221? F (105? C). Meets or exceeds ASTMB-172. #2 gauge highly flexible welding cable manufactured with 636 strands of fully annealed soft-drawn copper. Uses paper separator between copper and outer EPDM jacket. Will not kink, even in cold weather. Outer jacket has excellent oil, grease, water, flame, tear, cut and abrasion resistance. Rated at 600 volts. Conductor temperature range of -58? F (-50? C) to 221? F (105? C). Meets or exceeds ASTMB-172.